In contrast to the cytosolic protein PSD-95, the localization and trafficking of transmembrane proteins, such as the NMDA receptor, is intrinsically more complicated. Levels of complication are not only provided by synthesis and processing in the endoplasmic reticulum (ER) and Golgi apparatus, but also by the possibility of both vesicular trafficking and plasma membrane diffusion. At the level of the ER, the trafficking of the NMDA receptor is highly regulated. As with other receptor complexes, exit of the NMDA receptor from the ER is determined by successful assembly of a complete receptor28. This is usually constituted by the interaction of the obligatory subunit, NR1, with a type 2 or 3 subunit29. 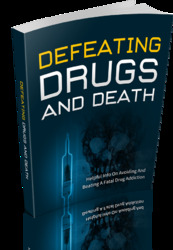 The majority of studies have concentrated on the 2A and 2B subunits of the NMDA receptor. The NR1 subunit contains an ER retention signal, which is masked by association with NR2A or B, allowing exit from the ER30,31. In addition, the retention signal can be modified by alternative splicing of the NR1 messenger RNA and by phosphorylation of residues in the C-terminal tail32. A switch between NR2A and NR2B subunits has been shown to occur during development with NR2A being the more abundant isoform at mature synapses33-35. It turns out that this switch is regulated at the level of mRNA splicing and appears to be activity- and integrin-dependent36,37. Once NMDA receptors leave the Golgi in transport vesicles there are two possible trafficking routes. Either the transport vesicles are hauled into and through dendrites by motor proteins or, alternatively, the vesicles fuse with the plasma membrane, allowing the receptors to move laterally in the plasma membrane. There is evidence for both these possibilities. Figure 14.1. NMDA Receptor Transport Packets. (A) Electron micrograph of a cortical neuronal dendrite labeled with immunogold for NMDA receptor subunit 1. The gold particles clearly label a vesicle that is tightly associated with microtubules (arrows). Scale bar = 200 nm. (B) Time-lapse images of NMDA receptor clusters in vivo. Clusters of GFP-tagged NMDA receptor subunit 1 are mobile (arrow and arrowhead) within the dendrites of an interneuron in the spinal cord of a zebrafish embryo at 51 h post fertilization. Time in minutes and seconds; scale bar = 10 ^m. (C) Model for exo/endocytic cycling of NMDA receptors with the plasma membrane during pauses of transport. NMDA receptors can travel both on vesicles within dendrites or in the plasma membrane. Electrophysiological and single-particle tracking studies have demonstrated that NMDA receptors are present in the plasma membrane38 and are relatively mobile prior to synaptogenesis39,40. 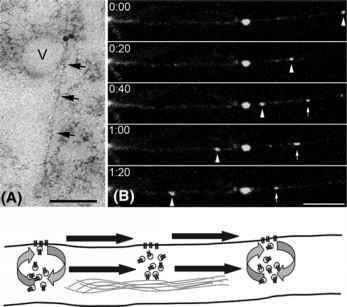 In contrast, EM and live-imaging studies suggest that NMDA receptors are present in vesicles that are transported along microtubules (see Figure 14.1)41,42. It is possible that both intracellular vesicular transport and plasma membrane diffusion is occurring. Evidence for a fusion these two models was recently presented. During the period of synapto-genesis synaptogenesis NMDA receptors in transport vesicles fuse with the plasma membrane and rapidly re-endocytose42. Live imaging of GFP-tagged NMDA receptor subunit 1 together with a tagged form of clathrin light chain demonstrated that endocytosis occurs during pauses in movement42. As development proceeds, the amount of NMDA receptors that are endocytosed is gradually reduced and is likely due to an interaction with PSD-9543. At mature synapses NMDA receptors are highly stable, which contrasts the very dynamic nature of AMPA receptors44-46. It remains unclear why NMDA receptors undergoing transport should exhibit this dynamic flux between the plasma membrane and intracellular transport vesicles. One possibility is that Golgi-derived transport vesicles contain a number of different cargo proteins, which need to be separated into separate vesicles or retained at the plasma membrane prior to targeting to the final destination. 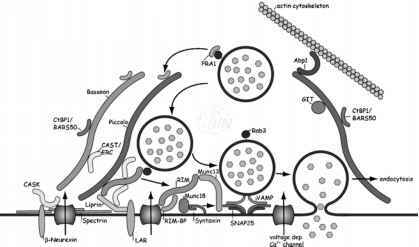 Such a sorting mechanism was suggested by data demonstrating that the synaptic vesicle protein VAMP/synaptobrevin appears at the somatodendritic plasma membrane prior to transport along the axon47. On the other hand, it is possible that NMDA receptors are required at the plasma membrane for sensing glutamate but are endocytosed periodically for efficient and directed transport. A requirement for the sensing of glutamate during development is suggested by studies of neuronal migration48 and synapse formation49,50. This is contrasted by pharmacological studies of neurons in culture51-53 and knock-out mice which are unable to secrete neurotransmitter54,55. In the latter studies, genetic ablation of genes involved in neurotransmitter exocytosis did not reduce the ability of neurons to develop synapses in culture and in vivo, suggesting that the secretion of neurotransmitter is not required to initiate synapse formation. However, it is also possible that the sensitivity to glutamate release may serve to increase the likelihood or location of synapse formation within the dendritic arborization56-59. Live imaging of GFP-tagged NMDA receptors during development has led to differing conclusions about how they are transported. A number of studies have shown distinct clusters of NMDA receptors which are transported along microtubules9,42. This was corroborated by a study which demonstrated the movement of the motor protein KIF17 as discrete clusters within neuronal dendrites41. Retrospective immunostaining of these clusters showed clear colocalization of KIF17 with NR2B60. In fact, NR2B has been shown to interact with KIF17 indirectly via mLin-10, CASK, and Velis41 (see Chapter 13). In addition, the clusters seem to move at around 8 |j.m/min in both anterograde and retrograde directions9. NMDA receptor transport clusters switch direction and stop often9. It appears that the clusters preferentially stop at clathrin hotspots42. The fact that these regions of the dendritic plasma membrane are constant sites of endocytosis61 suggests that endo- and perhaps exocytosis of the NMDA receptor-containing vesicles occurs at these sites42,43. Furthermore, the clusters present NMDA receptors both at the surface and intracellularly, suggesting a tight link between intracellular and extracellular pools of the receptor42. receptors to synaptic sites is separate from other postsynaptic proteins such as PSD-95 and AMPA receptors9,11,19,20. Interestingly, the MAGUK protein SAP-102 is associated with NMDA receptor clusters during transport42,62. It is probable that SAP-102 plays a role in directing the transport of NMDA receptor-containing vesicles toward the exocyst complex62. This complex is involved in delivering vesicles to the plasma membrane, further lending weight to the hypothesis that exocytosis plays an important role in the transport of NMDA receptor-containing vesicles. A switch in the abundancy of SAP102 and PSD-95 at postsynaptic densities during early postnatal development of rat hippocampus, suggests that these two MAGUK proteins are exchanged as binding partners for the NMDA receptor3,62. This could explain the reduction of endocytosis of NMDA receptors that occurs during this same period63 and thus begin to address a molecular mechanism for how receptors are targeted to and then maintained at synaptic sites.